a. A MOVE is a metric used to measure total volume or output of physical activity. It is similar to a MET, and it is unit-less, meaning it is not determined or affected by age, gender, height, weight, etc. MOVEs are an excellent way for our members to track performance and output. b. MOVEs are a fantastic way to measure performance because it levels the playing field between genders and different body types. It is important to track what has been done because it’s hard to measure where you want to be if you haven’t measured where you’ve been. Tracking each exercise and workout encourages us to perform better and better every workout, and if we can measure our results and see continued success, we are highly more likely to maintain that success. c. We track Heart Rate to ensure that we are training in the desired HR zones. Each different HR zone is important for obtaining different results in training, such as fat loss or increased VO2 efficiency. HR tracking also works to eliminate the possibility of overtraining, which can cause injury. Additionally, consistently tracking HR delivers detailed and accurate results, more so than other methods of tracking, and using this information one can monitor and even improve training effectiveness. Why track your training and workouts? d. Simply put, we track our training and workouts to measure progression. If we have a solid idea of what our training looks like and where our progression is heading, we can anticipate our body’s training needs and actually improve performance. Going back to measuring where you want to be and obtaining these results, these things are best accomplished by knowing how well you perform during your workouts and the ability to continually adjust what you’re doing for increased results. This is best done through tracking. 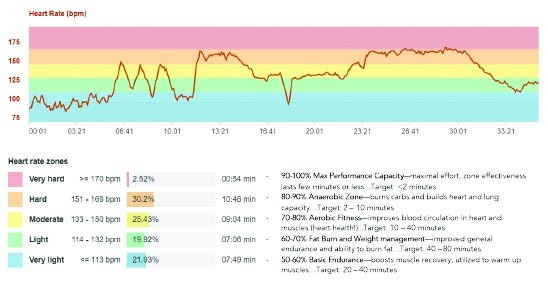 The graph below is an example of a workout tracked with a HR monitor. These monitors can be used during certain classes and personal workouts. Below the graph the different HR zones and the amount of time spent in each zone can be viewed—explanations of each zone have been added to the right of the key. Understanding the HR zones and recommended time spent in each, in tandem with tracking your HR, can drastically improve training effectiveness and achievement of desired results.